Mike Fiechtner Photography || Seattle Wedding, Family and Senior Photographer — Getting My Exercise! Over the last several weeks in Seattle we've been fortunate enough to have some nice weather for February. Maybe not California or Arizona nice but Seattle nice. With the nice weather I've decided to bring my camera to work everyday that I've been in the office. Well every lunch for the last couple weeks I've ventured out around 11:30 for an hour photowalk. 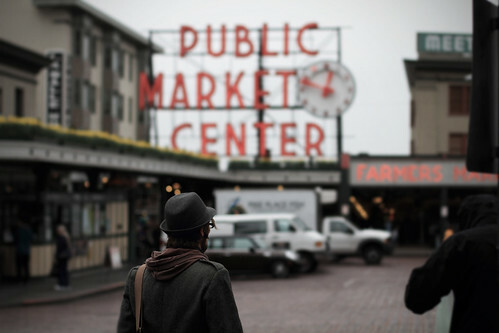 My walks have taken me all over downtown and they seem to either start or end of at one of two locations, the Seattle Central Library or Pike Place Market. I'm not sure what draws me to these two locations. I think it's become this challenge to find an interesting shot that no one has taken. Some days have given myself a challenge such as using my prime 50mm for every shot or another time I tried to take all of my shots from a different height, so either setting the camera directly on the ground or take a shot from above looking down on something or someone. These walks have been a great challenge and also a good source of exercise. I'm also trying to be very intentional with each press of the shutter and not just take a bunch of random shots that I won't like later. So if you love photography like I do and have some time at work then bring your camera and get out there during lunch and challenge yourself! Hope you come up with some fun shots! Thanks for reading my blog! Notes or Post Processing: I lowered the saturation on this photo and added a little bit of a vignette around the edges. I also underexposed this shot a little on purpose. I was going for a "cinematic" theme like a still from a movie. This guy was just waiting for the light to change so he could cross the street. On my work computer this image is darker than our home computer. I'm still working on understanding color calibration in computer monitors, Photoshop and printers. A future post will hopefully address this and my frustrations. I hope the above image looks good on your PC or Mac and not too dark! Check out my previous blog post on "Finding a Different Perspective"